"This particular work is solving a critical problem that has inhibited the development of viable applications based on these materials," said Assistant Professor of Physics Hanwei Gao. Color tunability has always been possible with halide perovskites, but it's not been stable. For example, a device with this material might shine one color such as yellow, but then turn to red quickly if illuminated continuously by UV light. "When you design it, you want it to turn out how you expect," Wang said. Added Gao: "If you buy a yellow light bulb, you're not going to be happy if it is shining red after a few uses." Gao and Wang initially set out to make a higher-quality halide perovskite film that was smoother and more uniform than existing samples. 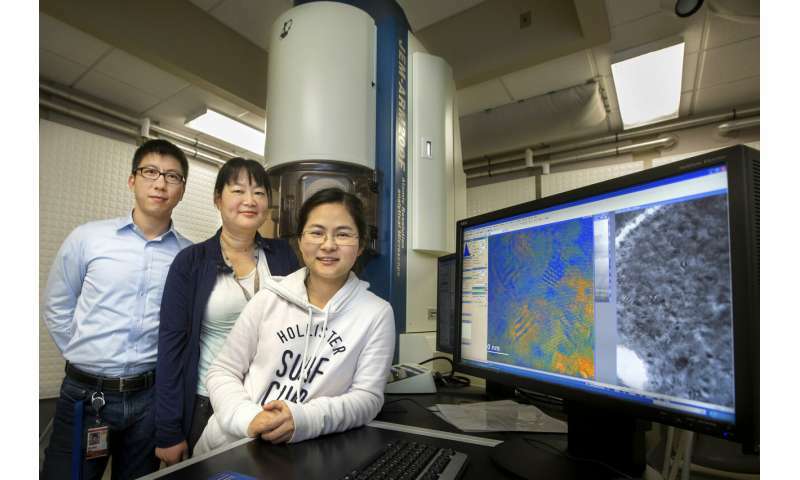 They embedded nanocrystals in a special matrix in their sample. They were not prepared for this to affect the bandgap, or the physical property that determines the color of light being emitted or absorbed by the material. "We were working on this synthetic approach and this nanostructure that was a part of that," he said. "Then we noticed the colors weren't changing." This unique nanostructure turned the previously unstable materials into extremely stable ones even when they are stimulated by concentrated UV light 4,000 times more intensive than the solar radiation.